Read the original text at kiis.com.ua. Kyiv International Institute of Sociology (KIIS) has performed an all-Ukrainian public opinion poll (5-21 February 2018). It has conducted 2,043 personal interviews with the respondents living in 110 settlements in all regions of Ukraine (except Crimea), using a stochastic sample, representing the population of Ukraine with the minimum age of 18-years and above. In the Luhansk and Donetsk regions, surveys were conducted only in the areas controlled by Ukraine. The statistical sampling error (with a probability of 0.95 and with a design effect of 1.5) does not exceed 3.3% for indicators close to 50%, 2.8% for indicators close to 25%, 2.0% for indicators close to 10%, 1.4% for indicators close to 5%. The survey in Russia was conducted by the research organization "Levada-Center" during March 23-27, 2018. The center has surveyed 1,600 respondents with the minimum age of 18-years, residing 136 localities. In general, Ukrainians have a negative attitude toward Stalin: 42% treat him with hostility, fear or hatred, 30% are indifferent, and 14% have a positive attitude (respect, sympathy or admiration). 28% of the population considers Stalin to be "a wise leader" (52% disagree with this), but 77% agree that "Stalin is a cruel, inhuman tyrant guilty of destroying millions of innocent people." 60% of the population noted that they do not believe that "our people can never survive without a leader like Stalin, who would come and put things in order." Three-quarters of the respondents indicated that they did not want to live and work under someone’s (like Stalin’s) rule. Ukrainians’ attitude towards Stalin is much worse than the Russians’ one (citizens of Russia). Only 14% of Ukrainians are positive about Stalin, while 40% of Russians think the same way. In Ukraine, 28% are considered Stalin wise leader who led the Soviet Union to prosperity, while in Russia, this figure reaches 58%. 23% of Ukrainians and 33% of Russians feel the need for a leader of the type, like Stalin. 77% of Ukrainians and only 44% of Russians consider Stalin to be a brutal, inhuman tyrant. The population of Ukraine has a rather negative attitude towards Stalin and his role in history. For example, about half of citizens do not agree with Stalin's definition of either a wise leader who led the Soviet Union to power and prosperity or as a prototype leader, without whom the people cannot survive. A positive spectrum of emotions in relation to Stalin (14%) is three times less than negative. People of older age with (incomplete and complete) secondary education and low level of prosperity are more positive about Stalin and support him; these are residents of the eastern region. Compared with 2012, in 2016, a positive attitude towards Stalin declined, this decline continued in 2018. This is mainly due to a decrease in the proportion of those who respect Stalin. But compared with 2016, in 2018, negative and indifferent attitude towards him has slightly increased. The increase in the negative attitude was mainly due to the growth in the share of those afraid of Stalin. The emotional spectrum of the Ukrainians towards Stalin tends to the negative pole – 42% of respondents defined their attitude as "fear", "hostility, irritation" or "disgust, hatred." 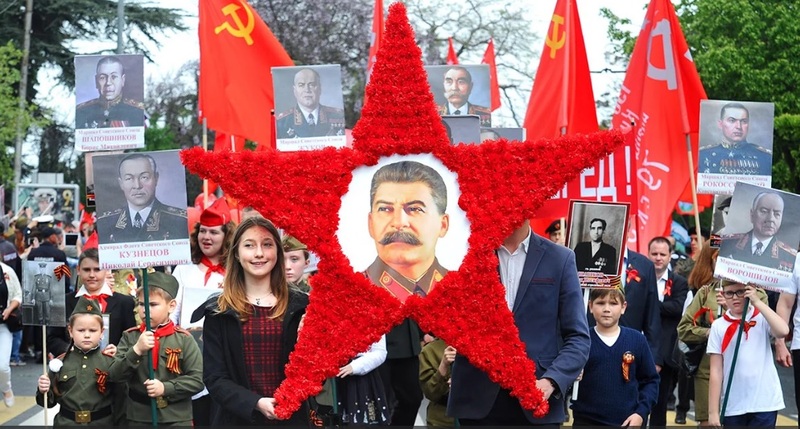 But the representatives of the older generation, including about 20% among respondents aged 70, demonstrate more respect for the Soviet leader. More than half of the population (57%) noted that they certainly would not like to work with such a leader. This attitude is more typical for the western and central regions, as well as for the younger population (up to 49 years). In addition, 28% of the population consider Stalin a "wise leader", 13% in the western region, and 48% in the eastern region. 77% of Ukrainians agree that Stalin was a "cruel, inhuman tyrant" (most of all, residents of the western region think this way - 90%). 23% of Ukrainians agree that the Ukrainian people would never be able to survive without a leader like Stalin, who would come and put things in order. If we consider the age differences in the attitude towards Stalin, in general, we will see that the representatives of the older generation are more positive than the younger ones. For example, 32.5% of respondents over 50 years of age define Stalin as a wise leader, and 27% of respondents in this age group agree with the proposition that people cannot survive without a leader like Stalin (against 19% among the 18-49 age group). Positive attitude to Stalin in the emotional spectrum of the eastern and southern regions differ: 15-17% of respondents in these regions expressed respect for Stalin. In the east, 5% treat Stalin with disgust, hatred, in the west, this category reaches 30%. In all regions, the majority of respondents would not have liked to work with a country leader like Stalin, this group of respondents is the most numerable in the western region - 86%. Stalin is more often considered to be a wise leader in the east, and in the west, he is considered as a cruel tyrant. Also, the attitude to Stalin varies depending on the level of prosperity of the respondent's family: a more positive attitude toward the leader of the USSR is observed among the poorest sections of the population. Thus, the proportion of those who consider Stalin to be a wise leader among the respondents with very low and low incomes varies from 30% to 33%, but among respondents with an average and high level of income, such 20-25%. Also, respondents with a lower level of prosperity showed more respect for Stalin, expressed a desire to work with such a leader, and agreed with the assertion that people cannot survive without a leader like Stalin. 75% of the population with low incomes consider Stalin to be a cruel tyrant, and among the population, which has high incomes, this figure reaches 85%. As for the differentiation by education, the following tendency could be traced: the higher the level of education of the respondent is the more negative attitude to Stalin he voices. In particular, among respondents with higher education 7% treat Stalin with respect, while among respondents with incomplete secondary education – twice as much. Conversely, there is a greater proportion of those who treat Stalin with hostility or disgust among people with higher education. The higher the level of education of the respondent is, the less he wants to work with such a leader and the weaker is the idea of the need for such a leader for the people. After all, 84% of respondents with higher education agree with the proposition that Stalin is a cruel, inhuman tyrant, this figure reaches 67-77% among other educational groups. In Ukraine, the negative attitude towards Stalin's personality is more common (42%), and during the last two years, it has somewhat increased. In Russia, the positive attitude towards him dominates, and the experience of negative feelings, compared to 2016, has decreased (to 12%). At the same time, the proportions of respondents who are rather neutral to the leader, or those undecided, are almost identical in both countries. Significant differences can be traced in support of various judgments about Stalin. So, among the population of Ukraine (in comparison with the population of Russia), the share of those who agree with the statement that "Stalin is a tyrant guilty of annihilating millions of innocent people" is higher (77% versus 44%). More than half of Ukrainians disagree with the statements that Stalin is a wise leader and that people cannot survive without a leader of this type; among the residents of Russia, the share of those who disagree with such statements is 18% and 37% respectively. "We can trace three periods In the dynamics of the attitude of Russians to Stalin: the dominance of negative perceptions (2001-2006), the dominance of indifferent attitude (2008-2012) and dominance of positive assessments (2014-2018). At the beginning of the survey almost every second Russian had a negative attitude toward Stalin (the total share of such feelings as "hostility", "fear," and "disgust" was 43% of respondents), in the period 2008-2012, they no longer exceeded a quarter of all thoughts about the leader. After 2014, negative attitudes toward Stalin were shared by about 17-20% of the respondents, in 2018 they reached a minimum value of 12% of the sample as a whole. The trend of increasing the share of Russians with a positive or neutral attitude towards Stalin (in contrast to a clear decrease in negativity) is less stable and more cyclical. In 2001 the proportion of Russians with a positive attitude (the sum of three positions - "rapture", "respect" and "sympathy") was almost four times higher than the share of Russians with neutral perceptions, by 2008, indifference began to predominate in regard to Stalin's image, which was replaced by positive assessments in March 2014. Earlier, we repeatedly noted that "post-Crimean consolidation" contributed to the reassessment of many events and processes in the life of the country." This press release was prepared by Liana Novikova.